Discerning travellers searching for rich culture, ancient history and unique wildlife will find this holiday encapsulating Peru and the Galapagos Islands a truly unforgettable experience. From the relics of ancient civilisations - including Machu Picchu, the ‘lost city’ of the Incas - to the colonial splendours of Cusco and Lima, Peru offers you a wealth of historical and cultural attractions. You’ll visit traditional mountain villages, explore local handicraft markets and discover the world’s highest navigable lake. From Peru, you’ll fly to Ecuador to board your seven-night Galapagos adventure aboard the M/V Origin. Each day of your cruise brings another island to explore and incredible encounters with tortoises, iguanas and inquisitive birds. You’ll drop anchor to go snorkelling and swimming with penguins and sea lions, and discover the unique geological history of this mesmerising archipelago. Price includes flights, full board at Explora Sacred Valley, Titilaka Hotel and aboard the Origin, and bed & breakfast at Palacio Nazarenas Hotel, Belmond Miraflores Park, Casa Gangotena and Hotel del Parque. Based on two people travelling. Your holiday begins with an overnight flight from London to Lima, where you’ll connect with an onward flight to Cusco. Upon arrival, you will be met and transferred to your hacienda-style hotel in the Sacred Valley, with beautiful views of the surrounding mountains. You’ll find yourself in the perfect position from which to explore the many wonders of the region, from the fascinating archaeological sites of Ollantaytambo, Moray, Chinchero and Pisac, to the towering peaks of La Verónica and Incañan. You’ll have time to observe traditional Andean weaving techniques, browse local handicraft markets, go biking along mountain trails and soak up the history of the Inca Empire from the relics they left behind. Today you board the luxurious Hiram Bingham on a memorable train journey from the Sacred Valley to the ancient citadel of Machu Picchu. You’ll pass an ever-changing landscape of lush fields, picturesque villages, dramatic mountains and the scenic Urubamba River, whilst onboard guides will explain points of interest en route. Enjoy a delicious three-course brunch on board before arriving in the town of Aguas Calientes. 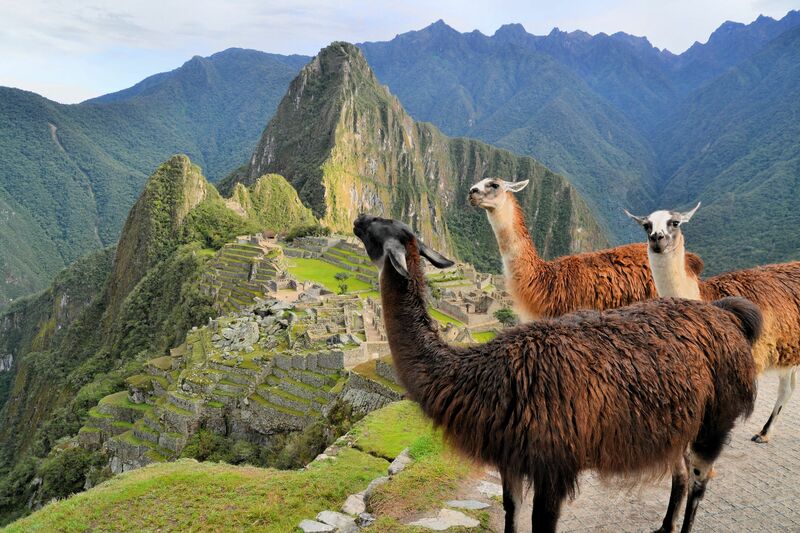 From there you will hop on a bus to Machu Picchu for a guided tour of this world wonder. You’ll have time to explore the wondrous terraces, temples, palaces and fountains, all beautifully preserved and surrounded on all sides by deep green forest. After the tour, you’ll take the train back to Cusco and be transferred to your exclusive hotel just behind the city’s main square. Enjoy a guided tour of the city, a UNESCO World Heritage site home to attractions like the colonial Santo Domingo Convent, Plaza de Armas and Koricancha temple. You’ll also venture beyond the city to discover the temple and amphitheatre of Kenko, the red fortress of Puca Pucara and the magnificent fortress-temple complex of Sacsayhuaman. Today you will take another train ride, this one from Cusco to Puno which takes approximately ten and a half hours. The journey, though long, is rich in natural beauty and will take you from rolling Andean plains – dotted with grazing alpacas – to towering Andean mountains and deep valleys. You’ll be met at Puno station and be transferred to your hotel on the shores of stunning Lake Titicaca. Straddling Peru’s border with Bolivia, the lake spans some 8,500 square kilometres and ranks as the world’s highest navigable lake. Its shores are populated by the Aymara and Quechua Indians who are some of the oldest peoples in the country. During your stay, you’ll be able to explore the area on trekking, mountain biking, kayaking, horseback riding and bird watching excursions. As well as enjoying trips to archaeological sites, colonial churches and the lake’s made-made floating islands which are home to the Uro people. Lima, the capital city, is the next destination on your Peruvian adventure. A half-day, privately guided tour will reveal much of what the city has to offer and immerse you in its 2,000-year-old history. You’ll first explore the historical centre, making stops at the famous Cathedral and Church of San Francisco, before going on to Casa Aliaga, a beautifully preserved colonial mansion. The tour rounds off in the residential districts of San Isidro and Miraflores. From Lima, you now catch a flight across the border to Quito in Ecuador. A designated World Cultural Heritage site, the city is full to the brim with impressive colonial churches, monasteries and mansions dating back to the16th and 17th centuries. It has an eqaully rich artistic heritage, with contemporary paintings, sculptures and traditional crafts to be found in its galleries and boutiques. From your fantastically located hotel, you will set on a guided tour of the meticulously preserved Old Quarter to discover the Presidential Palace, Independence Plaza and Cathedral. Don’t miss out on a visit to the temple of La Compañía de Jesús, with its dazzling gilded interior, and the Church and Monastery of San Francisco. Today you board the exclusive M/V Origin for a seven-night cruising adventure in the Galapagos Islands. Throughout the journey, you will enjoy daily panga, snorkelling, kayaking and island excursions alongside experienced naturalists guides, who will give you a fascinating insight into the islands wildlife, history and geology. The first couple of days are spent exploring San Cristobal, an island which boasts a staggering display of birdlife including blue-footed boobies, magnificent frigatebirds, storm petrels and swallow-tailed gulls. You’ll walk along the white coral beach at Cerro Brujo and have the opportunity to swim with sea lions. The following day on Espanola Island you’ll visit Punta Saurez and Gardner Bay, the latter of which is known for its large sea lion colonies. Keep an eye out for the waved albatross which can be found nowhere else in the Galapagos. On the fourth day, your cruise brings you to Punta Cormorant, one of the archipelago’s few populated islands with an excellent snorkelling spot at Devil’s Crown, and the historic Post Office Bay where you can drop off a postcard. On Santa Cruz, you’ll see giant tortoises in their natural habitat as well as the island’s largest lava tubes known as “the tunnels”. On the fifth day, you’ll visit the Charles Darwin Research Centre where scientists conduct fascinating biological research. On Bartolome Island, you’ll be welcomed by an incredible moon-esque landscape studded with lava bombs, spatter cones and cinder cones. You’ll climb to the summit of a once-active volcano, and later, visit the lagoons at Las Bachas where you will discover an abundance of Greater Flamingo. You’ll also have the chance to snorkel amongst Galapagos penguins. Day seven brings you to South Plaza and North Seymour, the latter of which is home to the archipelago’s largest colony of magnificent frigatebirds. You’ll then return to the ship for the Captain’s farewell cocktail party. On the final morning, you’ll stop by the Interpretation Centre before disembarking and catching a flight back to the mainland. Following your cruise you will spend one night in the port city of Guayaquil, staying at a charming boutique hotel in the elegant neighbourhood of Samborondón. You’ll be ideally positioned for exploring sights like the Sánchez Aguilar Theatre, as well as enjoying coffee roasting, chocolate tasting and wildlife walks in the tropical grounds of Guayaquil Historical Park. This morning, after a final tour of the city, you will board your flight back to London.